There are four basic types of valve positioners: pneumatic, electronic, electro-pneumatic, and digital. Pneumatic devices send and receive pneumatic signals. They are intrinsically safe and can provide a large amount of force to close a valve. Single-acting or three-way pneumatic positioners send air to and exhaust air from only one side of a single-acting valve actuator that is opposed by a range spring. Double-acting or four-way pneumatic positioners send and exhaust air from both sides of the actuator. Electric valve positioners send and receive electrical signals. There are three electric actuation types: single-phase and three-phase alternating current (AC), and direct current (DC) voltage. 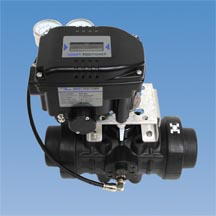 Electro-pneumatic valve positioners convert current control signals to equivalent pneumatic signals. Digital or “smart” devices use a microprocessor to position the valve actuator and monitor and record data. They are very accurate, use less air than analogue positioners, and allow for online digital diagnostics. Performance specifications for valve positioners vary by pneumatic input signal range, maximum supply pressure, milliampere input signal range, split range, operating temperature, and output action. Pneumatic input signal range and maximum supply pressure are measured in pounds per square inch (psi). Split ranges commonly include 4 – 10 mA and 12 – 20 mA. Two-way, three-way, and four-way splits are available. There are three types of output actions: direct, reversible, and field reversible. Direct action devices increase the output signal as the input signal increases. Reversible action devices decrease the output signal as the input signal increases. Field reversible products can be switched between direct and reversible action. Intrinsically safe (IS) valve positioners do not produce sparks or other thermal effects that would ignite a specified gas mixture. Devices that are made from stainless steel are used in corrosive or high temperature environments. The valve positioner should also come with a valve position indicator that suits the intended application. Valve positioners differ in terms of applications, features, and approvals. Some products are designed for automotive, aerospace, marine, medical, or military applications. Other products are suitable for food processing or pharmaceutical applications. General-purpose devices are commonly available. Common approvals for valve positioners include marks from the Canadian Standards Association (CSA) and Underwriters Laboratories (UL), an independent testing organization. Additional standards can be found at the IHS standards store. IEC 60534-6-2 - This part of IEC 60534 is intended to permit a variety of positioning devices, which respond to a rotary motion, to be mounted on the actuator of a control valve, either directly or by employing an intermediate mounting bracket.